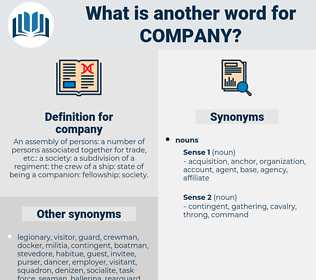 What is another word for company? An assembly of persons: a number of persons associated together for trade, etc. : a society: a subdivision of a regiment: the crew of a ship: state of being a companion: fellowship: society. go hand in hand with. providers, outcomes, traders, NS, assurances, Standards, launches, Expenditures, pictures, airways, IAS, Societies, Gems, lands, business, Businesses, compagnie, Its, Has, corp., undertaking, Undertakings, co, aktiengesellschaft. servicemen, data, companionship, NS, business, endeavour, conglomerate, undertaking, Undertakings, co, multinational, IPAD, endeavor, provider. corporations, Operators, enterprises, venture, ventures, corp.
forlornness, disintegration, retirement, seclusion, privacy, solitude, dispersion, separation, independence, lonesomeness. You don't think I'm likely to stop in your company, do you? Do you ever see company? electronics company, Ld., auto company, target company, printing business, livery company, pharma, record company, subsidiary company, food company, removal company, service, mover, corporate investor, Ltd., union shop, broadcasting company, dot com, open shop, Trainband, moving company, printing company, packaging company, public mover, number, pipeline company, removal firm, dot com company, East India Company, shipper, think factory, shipping company, film company, car company, steel company, stock company, white knight, limited company, dot-com, joint-stock company, cohort, subsidiary, holding company, packaging concern, oil company, mining company, printing concern, drug company, bureau de change, pharmaceutical company, think tank, takeover target, furniture company, closed shop, attendance, transportation company, distributor. establishment, institution, unit, social gathering, social unit, social affair, army unit.